Heavy virgin naphtha. Poor stripping of jet fuel will cause a low flash point of the jet fuel product. To raise the flash point, the end point of the heavy virgin naphtha product is increased by pulling harder on the heavy naphtha draw. In effect, lighter boiling range jet fuel components are down­graded to heavy virgin naphtha. Diesel oil. Poor steam stripping of diesel will increase the jet fuel composi­tion of the diesel product by 10% to 15%. Atmospheric gas oil (AGO). Heavy boiling range jet fuel components will be downgraded to fluid cracker feed due to poor stripping of the AGO product. Vacuum distillate. This stream was directed to the refinery’s recovered oil system (i.e., slop) and eventually reprocessed at the delayed coker. The jet fuel conlent in the slop would hence be commingled with low-value light coker gas oil. 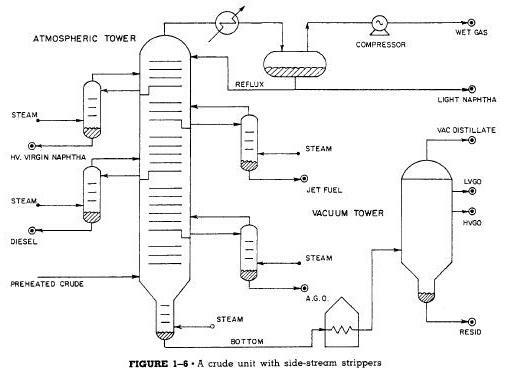 Poor steam stripping efficiency in the bottom of the atmospheric fractionator could leave up to 1,000 B/SD of jet fuel in the vacuum distillate product.